Largo Resources rallied in 2018 invigorated by skyrocketing vanadium price, then corrected. I believe Chinese demand will support vanadium price in the long term. Previous dramatic vanadium market sell-off in the 2010s because of oversupply is not about to happen because of Chinese tight environmental regulations. VRFBs create certain demand, but high prices make the technology too expensive and inapplicable. Largo Resources is not overvalued with relatively low trading multiples. 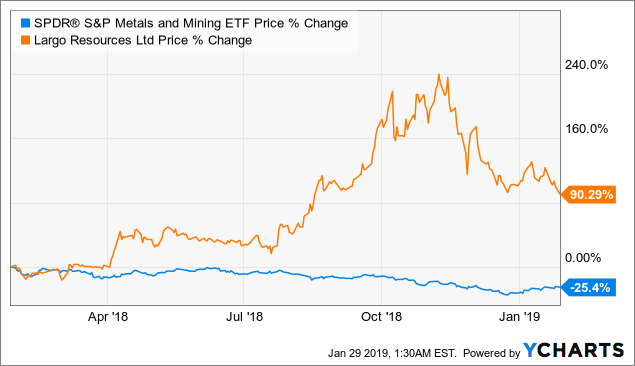 In 2018, Toronto-listed Largo Resources (OTCQX:LGORF) vigorously rallied from US$1.05 on January 29, 2018, to US$1.96 on January 28, 2019. On October 8, 2018, it surpassed a US$3.28 landmark, the highest level in a year. January 2019 was not an auspicious month because dynamic 2018 rally has already slowed in November mirroring vanadium price (ferrovanadium and V2O5) and since then sell-off has begun. Plummeted V prices were partly caused by Chinese mills that ignored new steel regulations, but this is not a long-lasting issue, and I will take a more in-depth look at it below.